Over the last 24 years of teaching, I have developed courses for the Ministry of Education, the local Bluewater School Board, and for both West Hill and Grey Highlands Secondary. 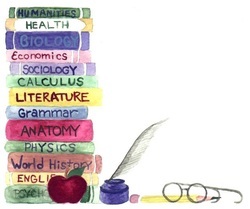 I have taught and written materials for all the senior level History courses (West and the World, American, Ancient Civilizations, 20th Century), as well as English (ENG1D), World Religions, Philosophy, Civics, Canadian History, Peer Leadership, Film Studies, Communications Technology, Consumer Design (Yearbook), and Computer Engineering. I am always willing to share my "stuff", so if there are any particular pieces that you are looking for, please feel free to email me. For 2017-2018 I am teaching courses in Film Studies (AWR3/4MI), Consumer Design (AWE3/4MI), eLO Philosophy (HZT4U), and Communications Technology (TGJ2OI).